What a beautiful day it is. While the Americans celebrate their independence, life goes on the normal way in Australia and this backpacker gets on the road again. Towards Perth, that seems to be another few days of hitchhiking away. But I never expected what happened today when the Pilbara Police District decided to give me a ride in a police car. I had another breakfast with my last chocolate paste sandwiches and did some writing on my laptop. I had a coffee and enjoyed the fresh morning sun. I noticed how it's getting a bit cooler the more I move south. I also noticed how the air reeked of iron, the main industry of Port Hedland. The big iron ore factories were located not far from the Dingos Oasis hostel. Jess and Phoebe took off around 10ish and I wished them luck with their hitchhiking. If I'd be in Perth in three weeks, they'd be back and they'd promised me a party night out whenever I'd still be there. That always sounds good. Sue took me along in the open roof Volkswagen van, as she had to do a pick-up at the bus station in town. Here I hauled my gear into the car of the Port Hedland Backpackers as the driver offered to drop me on the highway, out of town. Man, what an empty place was that. It occurred to me that if you live in a place like Port Hedland, you really live there. People don't seem to leave it (and see me hitchhiking along the road). It took me over an hour to realize that I wasn't going to have any luck at the crossing I was standing. I decided to carry everything I have on my back and start walking for a while. Maybe I'd be luckier to be hitchhiking along a long stretch of road with nothing around me. 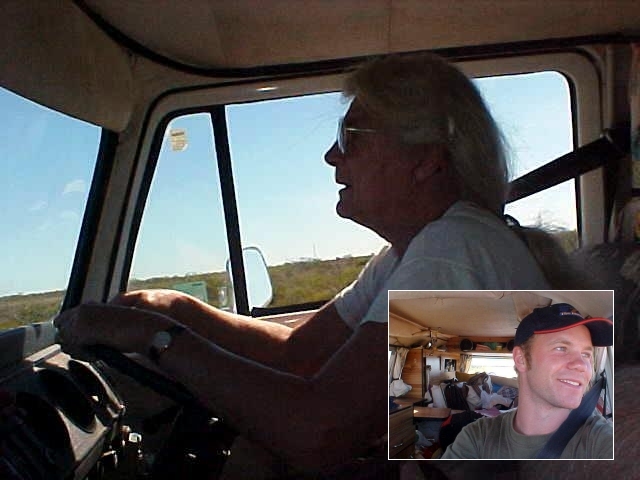 And I got a bit luckier, because an old lady pulled over with an overloaded van that was camping around on the west coast of Australia. I couldn't really communicate with her, as soon as I got my stuff in the van (which took a while because she had her entire house in there), she started rattling off stories about her birth in former Eastern Germany, the destruction of her life by her ex-husband, the freedom of Australia, her health problems (and she lit another cigarette), the weather, the mozzies that seem to die when it gets colder, about Europe and drugs and about the concentration camps for asylum seekers here nearby, and etcetera. I could only thank her for the ride when she dropped me off along the road, near some dry river. There she would be camping the night. From here I started hitching southwest again. The lady dropped me off 100km west of Port Hedland, where except a river shore camping ground, there was absolutely nothing else. Dry bush and cattle land surrounded me for as far as I could see. I walked along a piece of road and realized that next to the people who made this road, nobody else had probably walked here! I got a bit worried when after two hours of waiting, sitting around, putting on sunscreen, counting the ants that walked their path next to me, only four cars had passed and they all just drove on. Of course! 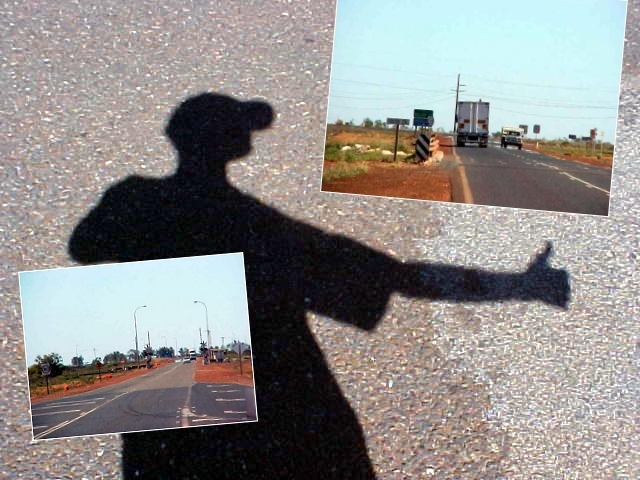 Who would pick up a hitchhiker along a deserted road! He must have a strange reason to be hitchhiking there! That's when I decided to start waving at the next cars, to get their attention from far away and help them understand that I am desperate for a ride along! Oh. God. A. Car. Pulled. Over. Yes! I ran to the passenger window and stuck my head inside. There was something I did not really expect around here. Three uniformed police coppers looked at me. "What are you doing here?" the one at the passengers seat asked me. "I am hitchhiking," I said. "First of all, hitchhiking is prohibited in every state of Australia..."
I knew that, but it's only a big crime when you do it at the wrong spots so you could cause accidents. That did not really seem possible out here in the hot sun. "...and you were just waving to cars. You are only allowed to wave at cars when you are in trouble." I listened to him and looked around me. In a circle of over 150km there was nothing civilized around me. My water bottle was empty already and it was pretty hot. Wasn't that enough of a trouble? I think I was stumbling with words, when somebody in the backseat told the coppers up front that they would take me along. They let me stuff my backpack and laptop bag in the back and drove me to the nearest police station in Roebourne, just 200km up the road. I did not feel thatcomfortable, however I also had nothing to hide from them. It was also kind of exciting, I never had been in an Australian police car before! In the backseat sat superintendent of the Pilbara Police District. He was in control of a geographical area of approximately 444,014 square kilometres (20 per cent of the state) and its population (2.48 per cent of the State). He was a big man, that Ron Carey. But as soon as the gang in the car found out that I was that guy travelling around the world without any money and totally depending on the hospitality of people who invite me through my website, the quiet radio in the background was turned off and three heads turned around to me. "Is that you?" they asked with amazement! "I have seen you on TV," one said. "I read about you in the West Australian last week," said another one. Only the driver couldn't remember knowing me somehow. "You know, I actually wanted to invite you over when I saw you on A Current Affair a couple of weeks ago, but I never got that far, you know?" the officer on the passenger seat asked, he got really involved in the conversation now. "Where are you staying tonight?" "I don't have any places to stay from Darwin to Perth, so I thought about just trying a hostel at the place where I'd end up today." I saw the man think. "You can stay with my family tonight, in Karratha," he told me. And suddenly I was the Australian police's best friend! I was taken to the Roebourne police station, where I was introduced with the police agents working there and of course I wanted to be arrested the official way. Just for fun of course, as I never had felt handcuffs on my arms before. Now I know how it is and I can tell you that handcuffs and me don't really combine. Nothing was said about my waving at cars or hitchhiking in Australia, I was surrounded by the amazement of police staff and officers who were in a way delighted to meet up with the Professional Freeloader himself! Geoff Reynolds was the staff officer that had invited me to stay at his place tonight. After the visit in Roebourne, we drove another long stretch of road before ending up in Karratha. Karratha is less than 40 years old. It all started around here when the iron ore mining companies needed a port to ship their ore and a port was created. Of course this attracted employment and the State cooperated in the establishment of the town called Dampier. Dampier and the archipelago to the north are named after the English explorer William Dampier, who landed on nearby Rosemary Island just off the coast in 1699. The Hamersley Iron Company built the port and modern town in the 1960's to provide a point of export for the inland mines, which rail their ore to the coast. As Dampier is built entirely on rocks and the folks there were running out of space behind the coast hills, Karratha was created on the other side. Population: somewhere about 11,000. Geoff told me all kinds of these interesting facts and drove me to his family home in this young town. There I met up with his wife Debby, who was a bit shy because of a sudden visit of this strange guy and met their young son Troy. I dumped my stuff in their guest bed room and joined Geoff for an afternoon beer when he finished his work a few hours later. While Debby prepared dinner, Geoff and I were enjoying the hot bubbling spa on their outside patio. During and after dinner (it got pretty breezy out here at night, I was experiencing the Australian winter) we talked a lot about my travelling, about the power of the Internet, life in Karratha and about Geoff's job as a police officer. "Where are you going tomorrow?" he asked me. "I have no idea, just towards Perth again. I have no invites along that road." "We'll see what I can do tomorrow. If necessary you are welcome to stay another day here if you please." I am thinking about ending this report with another Jerry-Springer kind of Final Thought, but I guess you'd be able to figure out one yourself. I at least learned that waving at cars is no offence at all; even waving down police cars can work out fine, haha!